President of Kyrgyzstan Kurmanbek Bakiyev has said that he will step down if security for him and his relatives will be guaranteed and that the interim government will ensure peace and order in the country. “First, there should be a guarantee that those armed people will stop wandering on the streets and that they will put an end to the current re-allocation of property and to the overall chaos in the country,” said Bakiyev at a press conference on Tuesday. “Second, me, my family’s and my relatives’ security should be guaranteed. And third, they should also start preparing the presidential elections, which should take place within the next two-to-three months,” added Bakiyev. 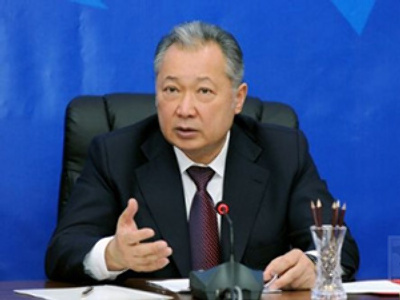 In response, the interim government said that they are ready to provide Bakiyev’s safety. “We are ready to provide security guarantees to Bakiyev and his family,” told journalists the current head of Kyrgyz Security Services Keneshbek Dushbaev. No agreement as yet has been reached on where the talks between Bakiyev and the new government will take place. Earlier, the ousted President has offered the interim government’s Prime Minister Rosa Otunbaeva to come to Dzhalal-Abad in the south of the country, where he is currently surrounded by his supporters. However, the new government insists that Bakiyev comes to the capital Bishkek. “We don’t trust him. He changes his mind all the time. Let him come here [to Bishkek] and answer us according to the law,” said the coordinator of the judicial system and law-enforcement bodies under the provisional government Azimbek Beknazarov. Meanwhile, Kyrgyz human rights organizations said they are ready to participate in the talks with the ousted president to help facilitate the process. Bakiyev has stressed that the situation in the country can be stabilized only by dialogue between the two sides, warning that unrest may continue as the number of those discontent with the new government is growing in the south. “I am ready for discuss with [the interim government] how to stabilize the current situation, because otherwise, I’m afraid, the unrest may repeat here in the south,” said Bakiyev in an interview to the radio station “Voice of Russia”. The president warned that the overall discontent of people in the south is growing towards those in the north. The ousted president denies media reports of Moscow’s involvement in the riots. Bakiyev also has denied some media reports, which say that Moscow tried to oust Bakiyev for failing to stop the operation of US airbase in Manas. “I don’t think it’s true. And I didn’t deceive Russia,” said Bakiyev. Then he said that the US contacted him immediately and said that they are ready to review the agreement, and only when new terms were set, the operation of the airbase continued. “Therefore, Kyrgyzstan’s international policies didn’t conflict with either Russian, Kazakh or Uzbek policies. They would have agreed to host the US airbase on the same conditions,” concluded Bakiyev. Earlier, Kyrgyzstan’s interim government stripped President Kurmanbek Bakiyev of his immunity status and threatened to arrest him if Bakiyev does not turn himself in. Coordinator of the judicial system and law-enforcement bodies under the provisional government Azimbek Beknazarov announced this ultimatum on Tuesday, April 13. Beknazarov added that Bakiyev’s immunity was removed by a special decree for what he called his ongoing attempts to unleash a civil war in the country: “As we see now, Bakiyev is trying to divide the people into northerners and southerners.” Bakiyev, in return, has accused the provisional government of exactly the same. “A criminal case has been opened against Bakiyev, and if he does not turn himself in after the Dzhalal-Abad rally, secret services will launch an operation to apprehend him,” warned Beknazarov, adding that if Bakiyev does not return to the capital Bishkek on Tuesday, he would be arrested. In response, President Bakiyev has refused to return to Bishkek. “I will not go to Bishkek. If they can’t even guarantee my security there, what kind of ultimatum is that?” the president said, as cited by RIA Novosti news agency. Earlier the head of the interim government Rosa Otunbaeva said that the new authorities cannot guarantee Bakiyev’s safety if he comes back to the capital Bishkek. At a press conference on Tuesday, Bakiyev also stated that he is not afraid of a possible special operation that the new government may conduct in order to arrest him. “I am not afraid of the special operation. It will not be able to decrease people’s discontent in the south of the country,” President Bakiyev declared. Earlier on Monday, April 12, Bakiyev threatened bloodshed if the interim government tries to detain him. Riots in support of the ousted president also continued on Tuesday. After the bloody unrest, which left more than 80 people dead and more than 1500 injured, Bakiyev fled Bishkek to his native village in the south of the country. A rally to support Bakiyev has continued for the second day on Tuesday, gathering about 2000 people in the southern city of Dzhalal-Abad. 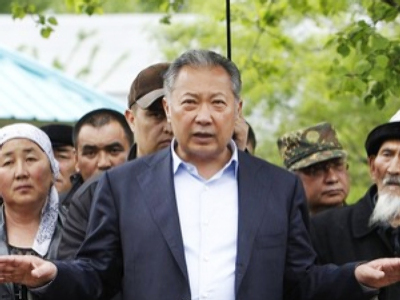 Bakiyev said that he felt personal responsibility for the recent unrest, saying that it was his “fault” that he “let it happen.” He added that he is ready for dialogue with the opposition and called on the United Nations to send peacekeepers to Kyrgyzstan to prevent further riots. In response to the current rally of Bakiyev’s supporters, acting Prosecutor General Azimbek Beknazarov warned of another rally that will be held in Dzhalal-Abad on Wednesday, to discuss the fate of President Bakiyev, pledging that people from the whole region will arrive for the rally. Arrest warrants have also been issued for Bakiyev’s close relatives and high-ranking officials, a spokesman for the country's Prosecutor General's Office told Interfax news agency on Tuesday. The president’s brother Zhanyshbek Bakiyev, who headed the State Guard Service; his son Marat, who worked in the National Security Service; former Kyrgyz Prime Minister Daniyar Usenov; and Defense Minister Bakytbek Kalyev are on the wanted list having been accused of mass murder and are suspected of giving the orders to open fire at demonstrators on April 7. The interim government has also suspended Kazakhstan’s Constitutional Court. “All this time the Constitutional Court has defied the Constitution, backing the interests of the families of [former President Askar] Akayev and Bakiyev,” said Azimbek Beknazarov. He added that the court would not resume its duties until a new constitution had been adopted.